Roxanna Brock McDade shares her personal account of what it feels like to zip-line down a mountain near Puerto Vallarta, Mexico. I had never been to Puerto Vallarta, so my autumn trip was full of pleasant surprises —and zip-lining down a mountain was one of my most memorable experiences. With an early morning start, filled with excitement and some anxiety, I headed with my group to the city’s marina, where we were whisked off on an inflatable jet boat to the other side of Banderas Bay and the confluence of a large river. On a desolate beach, set against a small fishing village, we made land-fall. Before you can zip-down you need to travel up, and so began our group’s ascent to the top of the mountain. The ride upwards began on the back of giant land-walkers, remnants from a 1970’s European army fleet. These vehicles travel straight uphill for 30 minutes, on a developed road at first, and then onto dirt tracks through deep water runnels, pot holes, and even through a river—a very bouncy ride! Upon arrival at the camp we harnessed-up and were guided the rest of the way on the backs of friendly mules, who appeared quite used to tourists and enjoyed their trek on the narrow water-washed trails through the thick jungle. When the canopy opened up we arrived at the top of the mountain. A large chasm below, with another mountain directly on the other side, signified the start of the real adventure. Did I mention this was my first ever zip-line experience? Having been a rock climber for over twenty years, I know the equipment used on this excursion well. The guides explained the process: how to position your body so you don’t spin; how to break with your strong hand; and how if you break too much you will get stuck out there in the middle of no man’s land—that would require a rescue. I took a deep breath stepping off the first platform, with my heart pounding, and started whirling down at lightning speed. Obviously I had not paid close enough attention to the directions because I immediately started spinning and came up short at the next station. After a couple zips, I realized a pulley-break system with a padded stopper enabled the guides to give a slow, controlled landing and so did not use my hands for a break anymore. I was hooked on the adrenaline rush and wanted to go as fast as I could. I also learned that leaning back kept me from spinning. From platform-to-platform—quickly, efficiently, meticulously and hilariously—the guides moved me down the mountain. After a couple of long horizontal zip lines, we were put on a line trending downward. This one evoked another small panic. I expected gravity to take control and cause me to hit the next platform hard, but the guide clipped my safety into a belay device that simultaneously controlled my speed while I was zooming downhill: I was perfectly safe. Next was a 100-foot rappel alongside a dramatic waterfall into a pool of water. Swimming through the deep water pool at the bottom of the rappel, I reached a ladder that took me down a long water slide. Other variations on the zip line include traveling backwards (attached to a partner), on a platform like a skateboard or hover board, and the best—the bat zip. The bat zip was my favorite and the most difficult. You descend upside down! Luckily you travel alongside another zip line with a friend—which I found comforting. You’re almost at the bottom when you relinquish your helmet and chest harness, and get handed a real hockey mask. I had no idea what followed, as I donned my mask and was lead to the grand finale. A short walk revealed a large platform leading to a massive water slide, which was about 60 feet long and downhill, before it wound through two fully enclosed loops and skidded into the finish (which was not visible). I wanted to bail, but I also wanted to get the full experience. It felt like a roller coaster, where your stomach moves into your throat for a second. I hit the covered loops, going round and round, and nearly pulled a 360 just before I shot out like a bullet into the straightaway—deep water, big waves—and it was over. A stack of fresh fruit and warm towels ended my adventure, accompanied with a belly full of satisfaction. Personal Items: No cameras are allowed on this adventure, but a camera man does take photos. Don’t wear jewelry or other trinkets. Carry a little cash to tip your guides – see Mexico tipping etiquette. Clothing: Bring quick-dry shorts and top—cotton will not keep you warm when it’s wet. A rain jacket is recommended if you visit during the rainy season (May to October). On dry days, wear mosquito repellent. You might like to bring a change of dry clothes for your trip back on the speed boat. Footwear: Wear good quality sturdy shoes designed to support your ankles and grip on wet, slippery terrain. 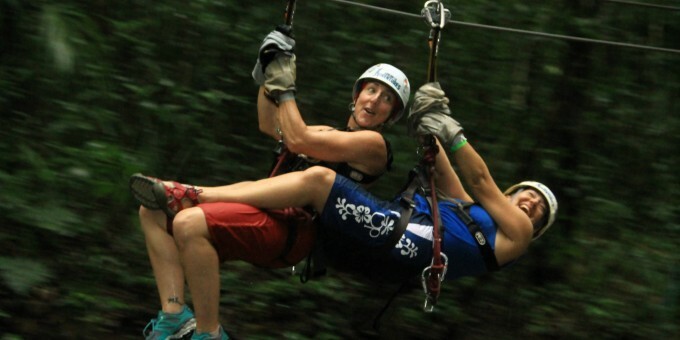 Roxanna’s zip-lining experience was organized through Vallarta Adventures in Puerto Vallarta, Mexico. Roxanna Brock McDade has been visiting Mexico since she was eleven years old. The culture, people and beaches keep her coming back again and again.